The SKEYE Nano Drone promises a wildly fun flying experience for any flyer, but the latest matte-black version look badass, too. It’s on sale now for 42% off MSRP, but Jalopnik readers can save an extra $5 with code SKEYEBLACK, and get it for just $34.99 + free worldwide shipping. This sleek, black re-skin of the popular SKEYE Nano Drone comes ready to fly right out of the box. 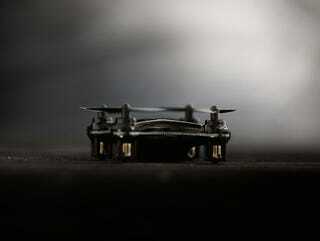 Its nimble design makes it perfect for indoor flights, but it’s pretty easy to control anywhere. You can fire up the built-in LEDs for night flights, and rest easy knowing you have 4 replacement blades for the inevitable bumps and crashes. Normally $69, it’s on sale now for $39.99 with included worldwide shipping. Today only, Jalopnik readers can save an additional $5 with code SKEYEBLACK and get it for just $34.99. Don’t miss out - grab yours at the link below.